Beaver Bother is a Bonus Stage found in the game Donkey Kong 64, accessible by entering a Bonus Barrel. 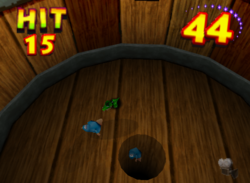 In this minigame, the player controls a Klaptrap and tries to chase the required number of beavers into the hole in the center of the barrel in 60 seconds. If the player falls into the hole themselves, they will automatically lose the game. The beavers move depending on where the Klaptrap is and if he is scaring them or not. Beavers re-spawn from the side of the barrel when some are herded into the pit, and the beavers recognize the hole if they are facing it, so they must be facing away from the hole to fall in. After the required number of beavers are herded into the hole within the time limit, the minigame is cleared, and the player is rewarded with a Golden Banana. Herd the beavers into the pit! Press to jump. And to scare them! This page was last edited on January 20, 2019, at 20:22.